Fullers’ Soaps is pleased to offer custom labeled amenities in squeezable tubes that are both ecologically sensitive and guest friendly. Our biodegradable tubes have the same durability and shelf life as regular tubes, yet they are made with an FDA approved organic based additive that causes them to breakdown after entering a landfill. This entire process of decomposition takes months to a few years as compared to decades or longer for traditional plastic tubes. The 1 and 1.25 oz flexible squeeze tubes are convenient to use and have a flip cap for easy dispensing. 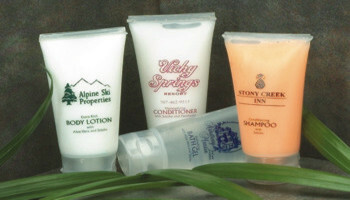 Our bath amenities include: conditioning shampoo, hair conditioner, body lotion, bath gel and bubble bath. 576 per case - $0.52 ea. 576 per case - $0.62 ea. Prices are per item - may not mix to reach minimums. All prices are F.O.B. / Factory. There is a plate charge on first order. Liquids are subject to 10% over / under per run.